The BC Reptile Club is a non-profit organization, and your membership fees go directly back into the club. It would be impossible to carry out the things we do without members. Membership funds allow us to put on our wildly popular Reptile Expos, as well as make donations to assist with local non-profit exotic pet rescue or rehabilitation. Family*- $30 *Family includes 2 adults, and up to 3 children. Please email the Membership Secretary for a membership form and other important details, or for any inquiries you may have. 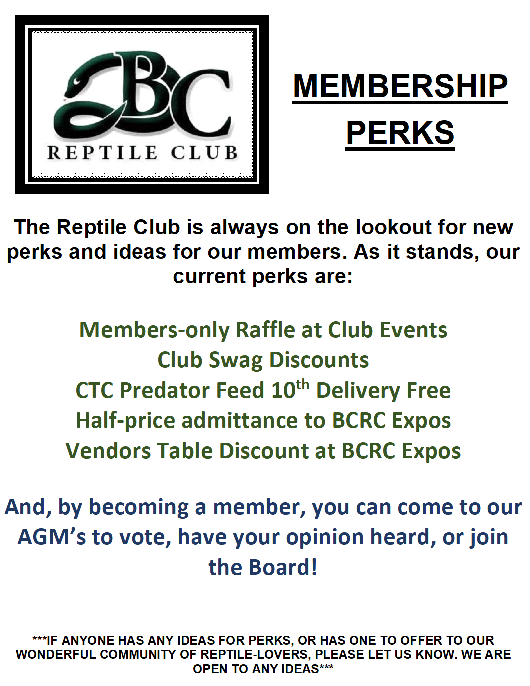 There are many benefits to becoming a Paying Member of the BC Reptile Club. Every Paying Member will receive a Membership Card! Just show your card (where applicable) to receive these benefits. For more information on CTC Predator Feed, click here! And more to come! If you would like to contribute a Membership Perk to the BCRC, please send us an email.